For my card I embossed the flower image in white on white cardstock panel. Then using colours inspired by the photo I watercoloured over the flower. Once it completely dried I stamped the verse using VersaFine Onyx Black ink. I trimmed a piece of royal blue cardstock slightly larger than the watercolour panel and adhered to the card base. A few sequins and done. I am also submitting this to the Simon Says Wednesday Challenge Anything Goes! How beautiful. I love the water coloring and how it looks with the crisp black sentiment. Tracey, such a pretty card, I ADORE the color wash! 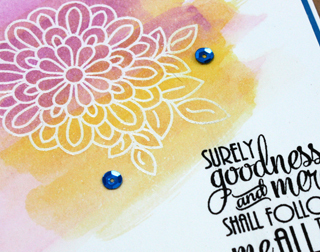 Love the watercoloring over the embossed flower - creates a great image! Gorgeous Moe...I love the soft water coloring against the more vibrant blue. Love the simplicity of this Tracey and it's feminine too! Beautiful--love the colors and the watercoloring! People who can create such beautiful one-layer cards have my deepest admiration. I wish I had talent for that, but unless it's layered and then layered again for good measure, I can never create something I like. I love your embossed flower over your color wash Tracey. Oh, I love that color washed background with the white heat embossed image. So pretty Tracey. Very pretty card with perfect verse! gorgeous! Love the emboss resist! This is beautiful, Tracey! Love your water coloring and pretty sentiment. This is so pretty. I like how you toned down the bright colors just a tad by using watercolor. So pretty! Love that watercolored background. This is very pretty! The watercoloring looks so nice! 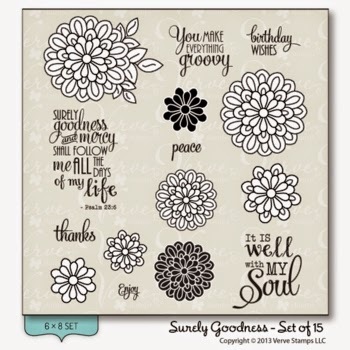 Thanks so much for playing along with us for Anything Goes week on the Simon Says Stamp Wednesday Challenge Blog! 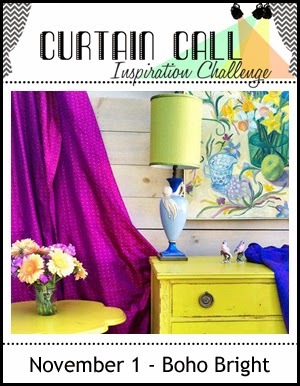 Perfect card for this challenge, love the water colour!